Quantum computers are currently best at doing a subset of tasks that regular computers can also do, except in a more expensive, esoteric, and inaccurate way. But this won’t be the case for much longer, as the field of quantum computing continues to hit new milestones. And new partnerships between IBM and some promising startups could help quantum computers reach their full potential sooner. IBM announced that it is adding a bunch of startups to its IBM Q Network, a group of teams who are allowed special access to the 106-year-old company’s quantum computers. They’ll be joining firms like JP Morgan Chase, Daimler, and Samsung that have already joined the network. “To try and solve practical problems for commercial interests, you need commercial companies,” Michael Biercuk, CEO and founder of Q-CTRL, one of the selected startups, told Gizmodo. Q-CTRL is an Australian startup working to suppress errors in IBM’s quantum computing hardware. Other startups include Zapata Computing, which will develop algorithms; QC Ware, which makes quantum software; and others that will be writing algorithms, software, and data analytics packages. IBM Q Network offers cloud-based access to IBM’s resources and expertise, as well as deeper access to its quantum computers. It will allow startups to perform actual experiments on the quantum computers. We cover quantum computers a lot, but a quick summary: Regular computers do all of their calculations using bits, switches that can equal either zero or one. Quantum computers instead have qubits, which are equal to a superposition of zero and one during the calculation. You can almost think of the qubits as a set of coordinates defining vectors one unit long. These qubits interact with each other through the math of quantum mechanics, which is just linear algebra using matrices and vectors with specific rules and more confusing notation, honestly. They entangle and interfere to solve big problems difficult for a classical computer to solve. That would potentially include modeling molecules, some artificial intelligence things, and breaking the most popular encryption strategies. 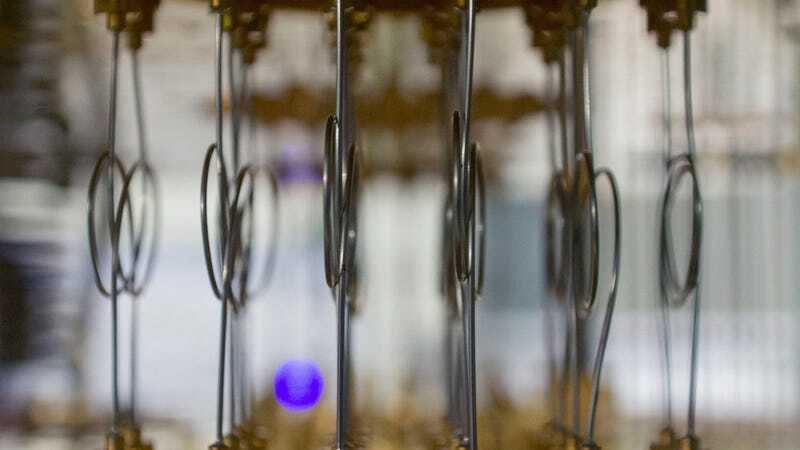 Quantum computing is in very early days, despite whatever hype you might hear. D-Wave Systems has its however-many-thousand-qubit quantum computer, but these are limited to only a specific kind of algorithm and haven’t proven markedly faster than a classical computer. Google built a 72-qubit quantum computer but hasn’t done much with it. Quantum computers have yet to definitively best a classical computer at anything, and they are imprecise—the qubits only stay in that quantum superposition for a short amount of time. IBM is one of the leaders, with a 5-, 16-qubit computer for general use and a 20-qubit computer that its customers can access, but we’re only at the start of the race. “Having democratized access to real quantum coherent hardware via IBM Q is a major change in our field that may help the community really find the killer app for quantum computing,” Biercuk told Gizmodo. There are algorithms that quantum computers might process better than classical computers, yet writers typically fall back on the same couple when we try to explain why these computers will one day be useful outside of a physics lab. Letting startups in might lead to more algorithms with real-world uses. “Just think of how the iOS developer portal and app store have fundamentally transformed the utility of mobile devices,” said Biercuk. Once again, this is emerging technology, and it’s hard to say how quantum computing might integrate into your life or into your computer experience. I’ve gotten used to rolling my eyes when people tell me what they think the computers might do in 40 years. They are not “dangerous and already making their own algorithms that we humans can’t even figure out,” as someone recently warned me. But you need businesses to build an industry, as nascent as it is, and IBM’s growing network is an important step.